A Blog to Discuss the Why, Perhaps, Maybe and How of all things Motoring. Long gone are the days when McLaren could woo the world with top speed records of 242mph. We know Bugatti broke that when it was released, hitting 252mph. There was the Ultimate Aero with 256mph, but I don't count that because it was a rubbish car. But now? Oh boy. 267mph. In a freakin' road car! Yes folks it has been made possible and by those who do it best. The Veyron's last hurrah is more like a last FU to other super car manufacturer's who thought they knew what they were doing. I'm truly staggered by this figure. I say it now: that record won't be beaten for at least 7 years. The fact you can drive this car without fuss on normal roads as well is what sets this machine apart, it wasn't designed soley to break top speed records. So what else is new with this Veyron Super Sport? 0-60 is the same at 2.5sec but it's at higher speeds where things change. 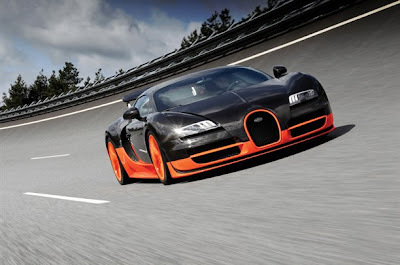 The Super Sport’s 0-124mph and 0-186mph times have been lowered to just 7.3sec and 15.0sec respectively. Apart from tampering with dampers, roll bars etc it's in the aerodynamic department where visual changes come to the fore. The front air ducts are wider and there is another set of ducts behind the front wheel arches. But it's the engine area where things are really unusual. Gone are the two huge silvery air ducts, replaced with cleaner venturi vents. Overall the car isn't pretty but dammit it has purpose. In spades. This is the end for the Veyron and it's illustrious achievements and boy has it bowed out in style. There are up to 30 of these masterpieces available before heaven's gate is closed. "Not Bad For a No.2 Driver"
The 107% Rule Is Back!